This article highlights some of the extraordinary adjectives that offer insightful explanations of the many different extraordinary characteristics of this extraordinary kitchen design concept. REVOLUTIONARY: It’s nothing short of it! Designing kitchens with furniture instead of cabinetry is a major conceptual revolution. Substituting the continuous ‘laboratory-like’ countertop for highly efficient work-centers is a major re-organization of design thinking. Now there are two major choices. Cabinets or super-efficient workstations! INNOVATIVE: YesterTec’s workstations that conceal cooking appliances are completely unique in the industry. NO other Major Appliance, Cabinet or Furniture company in the WORLD can legally and safely conceal ovens, cooktops, microwaves, warming drawers and standard dishwashers. YesterTec is the Trailblazer, setting a new standard of innovation. INCREDIBLE: Even the major appliance companies that make ovens never could have imagined how their technologically advanced products could fit so well into period homes. By concealing the best hi-tech products in low-tech looking furniture, incredible design opportunities are now possible for the first time EVER!!!! CREATIVE: Designing a kitchen with YesterTec’s workstations is a very creative and easy process. Pre-designed models have pre-determined sizes and a vast selection of available options to select. Since each piece can be styled differently, the design combinations are almost limitless, but because the palette of options is designed to be compatible, most of the guess work is eliminated from the process. Designers and consumers can be confident that their design decisions will work. They never need to ‘re-invent the wheel’! YesterTec already did it for them, while allowing them the greatest opportunity to ‘get creative’! EXTRAORDINARY: A YesterTec kitchen is a statement of independence. It’s not your mama’s kitchen. It’s not your Gramma’s kitchen. If you are a baby-boomer, it is more like your great-Gramma’s kitchen….with attitude! Lots of attitude! Those old kitchens contained independent pieces of furniture, but now YesterTec has made them beautiful and filled them with all the labor saving technology that we now can’t be without. A YesterTec kitchen combines the comforting qualities of days gone by with cutting edge technology that allows today’s high-tech appliances to be used, but not always seen. It’s the best of both worlds! Now, for the first time, the consumer can control what he WANTS to see. No longer does the Appliance Company or the Cabinet Company dictate what MUST be seen! GROUNDBREAKING: To create real kitchen furniture, YesterTec’s design team started designing from the ground up. We did not convert cabinets to suite the needs of furniture. We did not accept the idea that we needed to always see the appliances. We needed to find a better balance between cabinetry, appliances and ‘unfitted furniture’ the kitchen design concept recently popularized by the innovative English designer Johnny Grey. The qualities of properly designed workstations are so completely different that we simply could not rely on cabinetry and appliance standards to get the job done. Dimensions, proportions, and the integrated technology of YesterTec’s oven hiding system all came together in an entirely different form. It had to. The result? YesterTec has invented a new standard! TECHNOLOGICAL: YesterTec’s magic is grounded by innovative scientific research, design and testing to be sure that concealing heating appliances is safe. Underwriter Laboratories’ engineers have given the U.L. Listed status to YesterTec’s appliance concealing enclosures (furniture) and control systems that include the exclusive controls and switches. The U.L. labels on YesterTec’s enclosures tell every building inspector that these extremely unique products are safe. This is a new invention, unique to the kitchen industry! CUTTING EDGE: Because the appliance technology is recognized to be so special, YesterTec applied for and received a U.S. patent. So YesterTec’s innovative workstations have been on the cutting edge of the kitchen design industries for a long time. And the sky is the limit. YesterTec’s initial line of workstations only scratches the surface of what is now possible to achieve. ADVANCED: YesterTec’s exclusive innovative technology is augmented with the best innovations that the cabinet and appliances industries have developed. For example, our deeper than normal bases have 26″, full extension, completely concealed drawer slides. This is an elegant low tech look for a drawer system that produces 30%more accessible storage space than any standard drawer system. Another advancement; YesterTec pieces are finished with conversion varnish, a tough, stain resistant finish that will last through the ages. ELEGANT: The strength of each piece is not only a fabricating quality, it is a visual one. A simple elegant look is achieved by regulating the detail so that there is not too much nor too little. Each piece is supported from the ground up, giving it a strong elegant stance in any setting. Cornices finish each tall piece with a definitive conclusion, providing just the right amount of emphasis where it is needed. BEAUTIFUL: Why are YesterTec pieces so beautiful? Why are some people more beautiful than others? Maybe it is because the eye of the viewer is pleasantly comfortable with what it sees. The eye is not shocked except in a pleasant way. The classic proportions of historic buildings are beautiful because the eye is not confused. All the details of these buildings come together to support the overall design. YesterTec pieces are beautiful because the balance of color, texture, size, and proportion all come together in a three-dimensional object that is comforting to the eye. BALANCED: Already designed into the YesterTec system is the balance that is required to create a successful room design. Specifically, there are major workstations (Sink, Range, and Refrigeration/Pantries) and then there are minor pieces (Work-Tables, Working Pantries, Cupboards, Desks, Entertainment Armoires etc.) Balance is achieved by downsizing the minor pieces, allowing them to complement but not compete physically with the major workstations. If all workstations were the same size, they would all compete visually with each other. EXQUISITE: Subtle detailing gives YesterTec pieces their furniture quality appearance. Specifically, the beaded inset framed openings around each drawer or door are a refreshing change from the uniformity of frame-less cabinetry. Bases with carved out toe space cutouts always protrude out from the piece, replacing the continuous cantilevered 4″ kick-space found at the bottom of normal cabinetry. Simply detailed cornices consummate each tall piece, eliminating the need for an overhead soffit that typically crowns most cabinet installations. REFINED: There have been many examples of great design in the centuries that have preceded ours. YesterTec chose to use this information to build furniture that incorporates some of the best features of past designs. We have refined our own designs by learning from the great designers who have preceded us. We all live in an age where changes are made just because technology allows us to change things. That approach needs to be questioned from time to time. YesterTec questioned the idea of continuous cabinetry and discovered that refining an old idea (furniture) resulted in a truly unique and viable approach to kitchen design. BRASH: YesterTec is a young company, brash in its fervor to promote a unique concept in the ultra- conservative world of kitchen design. Most cabinet companies, when they talk about innovation, are talking about a new finish, a new door style or a new storage accessory. At YesterTec, innovation is all about a completely new kitchen design concept, a new way to conceal cooking appliances, a new way to market, sell, and install kitchens. That’s the definition of Brash. Granted, YesterTec workstations are different in almost any comparison level to the concept of cabinetry. Quality and innovation of the product line is top-of-the-line. But in terms of offering design expertise that assists customers who are planning their own kitchens, the YesterTec design staff is exceptional in our knowledge of the design capabilities of this new and unique concept. SCULPTURAL: A YesterTec Workstation is like sculpture in the garden. It rises from the ground visually carrying it’s own weight. It’s balanced, proportional, three-dimensional appearance changes as you walk around it and interact with it. All day, and into the night, light sources and the shadows they create changes it. Objects placed on or nearby them change its appearance, thus, its environment changes it. The same piece placed in a different room design takes on totally different qualities. Furniture is placed in a room, just like sculpture is placed in its environment. Cabinetry, on the other hand is more like wallpaper, and typically that’s how cabinetry is applied. In fact, the more uniform the pattern of cabinetry is, the easier it is for the eye to comprehend what it is seeing. 3-DIMENSIONAL: Unlike cabinetry, every workstation has three finished sides, and island pieces have four sides finished. The depth dimension is the most crucial in defining how efficient each piece can be, and it is also the dimension that most kitchen designers have not had to think about until now. Being able to vary the depth from piece to piece creates an entirely new 3-dimensional look as well as a new efficiency standard in the kitchen. PROPORTIONAL: YesterTec pieces vary in height and depth for a number of reasons. But when this happens, a designer must be acutely aware of how these dimensions affect the proportional balance of each piece. YesterTec has taken the guess work out of the design process by pre-designing each piece. Now the consumer can be assured that each piece will be properly proportioned, eliminating the experimental jitters always associated with a new prototypical design. ORIGINAL: YesterTec’s workstations are most successful when they are placed in rooms and surrounded by space. Homeowners can use these full-height vertical spaces to personalize their kitchens like never before. (Most cabinet style kitchens have only a back splash to use for decorating) Because of this new opportunity, YesterTec kitchens are always completely original. Case Study. One of our dealers took his YesterTec displays to a Home Show, then to a Designer Show house, then to his own Design Studio for display and finally, it was sold to a customer. In every setting, the three pieces looked completely different. Why? Because whatever was going on in the design motif surrounding the pieces changed them. BELIEVABLE: YesterTec pieces are real pieces of furniture. We use furniture in most of our other rooms every day. We know what it is. We believe in it. But convincing homeowners who are only familiar with cabinetry in their kitchens that furniture can do the job is a real challenge. YesterTec has turned many skeptics into believers, once they witness the incredible efficiency of the workstations. INTELLIGENT: YesterTec workstations were designed to function in a way that emulates how commercial cooks work. Typically, a cook uses workstation countertop areas that are deeper than domestic cabinetry. They have prep strips in front of the burners and extra staging counters above the work surface. YesterTec’s workstations are designed intelligently to maximize the working efficiency of the domestic cook. Rather than spreading the work areas horizontally away from a work source (sink or cooktop), YesterTec increases the surface and storage areas around these areas. ASTUTE: Why didn’t the other cabinet companies developed technology to hide heating appliances before YesterTec? It’s because YesterTec listened. We listened attentively to discover that the design trades were ignoring a design need. Once we discovered the need, we focused on the problem, experimented and relentlessly pursued the idea from a completely different perspective, unencumbered by industry standards. ENGAGING: Though difficult to describe, the idea of a furnished kitchen is intriguing! And once a YesterTec kitchen is experienced, it is thoroughly engaging. People simply don’t look at their old kitchens in the same light ever again. Why are people so charmed? It’s because the idea is so simple. One of those, “Why didn’t I think of this” ideas. Simply stated, it’s furniture. It’s super efficient, well-designed furniture. Once people realize that, they are hooked! UNPRETENTIOUS: A YesterTec kitchen is first and foremost an exciting, multi-purpose room for living. Now, rooms with very strong architectural features and design character do not need to be comprised by a stronger, lineal cabinet and appliance presence. Furniture allows these special features to continue between and around each piece, preserving the room’s strong design theme. In fact, YesterTec’s furniture is designed to quietly blend into the design motif of almost any room, unpretentiously preserving the integrity of the overall room design. Kitchens typically found in new log homes or post and beam construction cover up the rich structural elements of the room. Why? Because there needs to be a smooth wall to line up the continuous cabinetry. YesterTec workstations allow the logs or posts to be seen between each piece, preserving the continuity of the space. In these applications, the room or structure needs to be the star and the kitchen furniture assumes an unpretentious character. CLASSIC: YesterTec’s classically proportioned workstations are designed from the ground up to be flexible enough to endure design trends. They are designed to blend compatibly with more ornate or austere furniture and surroundings. UNIQUE: Each YesterTec piece has its own brass, sequentially numbered nameplate, which verifies the originality of each piece. They are not limited editions and they are not simply marked with a manufacturer’s stamp. Each piece is completely unique. This is impossible to do with cabinetry! And customers love it! DIFFERENT: Completely!! When YesterTec first started marketing their workstations, we really didn’t realize how different they were. But we soon realized that designers were completely unprepared to mentally handle the concept. It was almost too simple for them to handle. They had been accustomed to shoehorning cabinetry into every nook and cranny for so long that leaving spaces between YesterTec’s super-efficient pieces was too difficult to comprehend. Conversely, in one of YesterTec’s showrooms, a teenager was seen explaining the entire concept to her baffled mother in a matter of two minutes! Granted, it’s different, as different as apples and oranges, but that’s a good thing! People need a definitive choice, and YesterTec has definitely provided it! TIMELESS: Remember Avocado and Coppertone appliances? Primary color Formica countertops? Remember the pickled white cabinets, white and black kitchens, stained birch cabinetry? Design trends come and go, but YesterTec kitchens have been designed to become timeless. Stylistically, they represent no established style. They have been created to blend into their stylized environment. In addition, should the homeowner need to change the look of the kitchen, since each piece is separate, perhaps revising a single piece, or selecting a new piece will be sufficient. An entire kitchen replacement may never again be required. EFFICIENT: Efficiency is the key to making furniture work in kitchens. Eliminating the continuous countertop requires each furniture piece to become more efficient. YesterTec solves this problem by increasing the countertop and storage areas around each food prep, food storage and cooking area. Furniture made from converted two-foot deep cabinetry can not get the job done. Period! GRACEFUL: When creating an open plan room design by combining the kitchen with another living area, using cabinetry with exposed appliances usually creates a division between the kitchen and the living area. YesterTec’s furniture concept was designed specifically to make this transition much more graceful. By allowing the living area’s wall, floor and ceiling treatments to meander around and between each piece of furniture, the union of the two rooms is significantly more successful! ASTONISHING: At consumer and designer trade shows alike, we’ve watched as the attendees discover the concealed appliances and disguised storage systems in our workstations. It is the same reaction that our customers have reported to us when their friends are introduced to their own unique YesterTec kitchens. PROFICIENT: The intelligence of the design effort that has been embedded within the YesterTec system can be summed up by one of our customers, “The functionality of workstations is not fully appreciated until you have a chance to live with them for a while.” The test of time is the true test of how well a product or system performs! TIMELY: The design world is currently giving a lot of attention to the grossly misunderstood term ‘the unfitted look’ (which is rarely defined the same way twice). And they are also highlighting the current trend of concealing refrigerators and dishwashers in period cabinetry while, in the same kitchen, showcasing monstrous, fire-breathing, commercial-look stainless steel ranges. Introducing YesterTec’s workstation concept could not be timelier. YesterTec creates real furniture instead of trying to emulate it with cabinetry disguised as ‘the furniture look’. This is a major and refreshing distinction. And the ultimate hypocrisy of creating a period kitchen with the ubiquitous 21st century stainless steel range-center-piece can be completely avoided with YesterTec’s period sensitive, appliance concealing workstations. REMARKABLE: The media loves to see new pictures from YesterTec since the workstation concept is so radically different and news worthy. Stylists and Photographers shooting a period-designed kitchen no longer need to hide appliances behind bouquets of flowers or other props. They no longer need to block out most of the kitchen, shooting only the period-perfect cupboard or pedestal sink. Because in YesterTec kitchens, the technology that dates the photograph simply disappears! This is a remarkable change! SUPERIOR: YesterTec workstations must have stronger and therefore superior construction methods than any cabinet. Simply because YesterTec pieces are designed in large pieces to be moved over and over again (if the owners move and take their kitchen with them) the construction must be extremely durable to prevent racking during and after the move. Cabinetry, on the other hand, only needs to arrive safely, and since it is installed only once, it does not need to be built as strong. CONSUMMATE: YesterTec workstations can be the most ideal choice for many occasions. In older homes, with their many windows and doors, 3-D furniture, already finished on three sides is perfect to fit between the openings. Smaller lofts and open-plan apartments where the kitchen is never out-of-view are perfect candidates for a kitchen that ‘closes-up’ and becomes a collection of furniture when the cooking is done. HANDSOME: The strong colors and styles used when styling YesterTec pieces can take on a very masculine appearance. Just the fact that all the pieces sit solidly on the ground, celebrating this stance with substantially detailed bases gives them a masculine flair. The simple styling of the grid door designs (the grid pattern can be specified by the customer) is indicative of the subtle strength assigned to certain design options. FINE: What is ‘fine’ kitchen furniture as opposed to ‘not fine’ furniture. Most of us are not truly aware of what a fine piece of furniture is. Typically, if a piece is fabricated with particle board, covered in veneers, has simple drawer mechanisms and is mass produced and sold as part of a set, it is not a fine piece. On the other hand, extremely beautiful, hand-built, hand-finished, solid wood constructed pieces that our fore-fathers made, or our best manufacturers make today, may not be appropriate for kitchen use. Fine furniture, tough enough for kitchen use is a new concept. YesterTec strives to produce the finest furniture that money can buy for kitchen use. BEST: Now, like never, ever, before, there is a major first decision to be made when designing a kitchen. To find the ‘best’ kitchen design, the choice of workstations in lieu of, or in addition to cabinetry can now be considered. The best design is typically the one that is ‘most appropriate’ for the particular design problem. It solves most of the design parameters of a particular problem in a better than satisfactory way. YesterTec’s workstations can usually solve most design problems with satisfactory results, and many times, a YesterTec solution can be the best solution. The point is, without at least considering YesterTec’s workstations, the ‘best’ solution may never be discovered! AWESOME: YesterTec has been told by our customers that walking into the Pennsylvania showroom is an awesome experience. We know that seeing many of the exclusive designs all in one place is exciting, but for our clients, the pioneers, the original thinkers who have been anticipating a visit, it is an awesome experience. Walking around, opening and closing the doors that hide the appliances, seeing pieces that have been featured in so many national publications up close for the first time, YesterTec’s customers are ultimately very pleased with themselves for having discovered and visited the showroom. As they should be because the difference between seeing workstations in a photograph and experiencing them in reality is quite substantial. The 3-D qualities that define the appearance and efficiency characteristics of YesterTec’s furniture can best be appreciated in person, especially for people who have only been accustomed to seeing standard cabinetry. BENEFICIAL: A real plus for any product is if it has a real, lasting benefit for society. YesterTec workstations are not beneficial because they give a consumer a different way to consume. Consuming is not an enviable trait on its own. But by creating a kitchen design concept, and products that allow rooms to combine usage, huge benefits can result. For the first time, a kitchen/living area can completely eliminate the need for a separate living room, dining room, even study or foyer, thus saving under-utilized square footage! Why? Because YesterTec workstations can actually allow a room to have a formal look and informal functionality and visa-versa! By controlling exactly what a consumer wants to see, rather than accepting only what the appliance and cabinet industries produce, Home designs can finally become more efficient. The quality over quantity concept can finally become a reality. Saving square footage, while increasing the quality of the built environment experienced on the domestic level is truly a benefit to society. And saving space is the most ‘GREEN’ approach to any design as it conserves both materials and future energy use. ENDEARING: Remember your first really great new car? Remember how you felt driving it. How your thoughts were consumed in it, wrapped up in it every time you drove it. That’s what YesterTec’s three dimensional kitchen furniture does to you. Because it is so sculptural, so different, so exquisitely crafted, you find yourself engrossed in it more than you can even believe. We recently had a client call us just to say how her YT kitchen, installed 3 years ago, is such a pleasure to work in, to look at etc. In fact, her husband who had listened to her accolades once too often told her to call us! COMFORTING: What are the comforting qualities of a room? What elements of room design give you comfort? Chances are, sunlight streaming through a window, a fire in a fireplace, the fabric or leather upholstery on your favorite reading chair. It could be an antique desk piled with personal correspondence, or a braided or oriental rug. Perhaps it is a collection of bobble-head dolls, rolling pins or wine bottles. Maybe it is the portrait of Gramma, or the photo with four generations of your family. Did I mention cabinets, exposed appliances and countertops? Sure, for some, they can have comforting qualities, but for most of us, probably not. The point? Independent workstations allow the homeowner to fill the room with the comforting things in life in the spaces that are created between each piece. The personality of the homeowners has many more opportunities to be displayed when using furniture than when using cabinetry (where typically only the backsplash area is available for personalization). WARM: The color pallet of YesterTec’s furniture has been derived from studying the warm patinas of classic and aged furniture. The paint colors are muted, sometimes by combining gray into the pigments. The limited unpretentious color choices allow the furniture to blend with more or even less vibrant room décor themes. REASSURING: YesterTec pieces are expensive. There is no denying that no expense is spared when finishing a minimum of three sides on each piece, adding bases, cornices, using built-like-a-tank solid wood construction methods, full extension concealed drawer slides and safely concealing appliances with U.L. Listed technology. So if one or more of these exquisite pieces is sitting in your kitchen, you can be reassured that you have reached a high level of personal accomplishment! HUGGABLE: In the same way that your eye (and many times your hand) interacts with a piece of sculpture, experiencing its expressive bumps and curves, you can experience the sculptural qualities of Workstations in the same way. You can lean on them, sit on them, run your hands and eyes all over them. Around its corners and cornice, continuing around its sides and back. In they same way that we are so comfortable viewing and recognizing ourselves (humans) as 3-dimensional beings, YesterTec workstations are easy for our senses to recognize and appreciate! Have you hugged a Workstation lately? Have you even tried to hug a cabinet? FLEXIBLE: The true measure of a good design concept is how flexible it can be when adapting itself to many different situations. This was a major concern when YesterTec workstations were being developed. How universally adaptable could it be? It turns out that because kitchens can be composed of all workstations, or only one or two that combine with standard cabinetry, it is a difficult to find a kitchen that could not accommodate the concept of kitchen furniture. MULTI-FUNCTIONAL: Rooms that need to be more ~ and less than just kitchens. That’s a description of almost every kitchen on the planet. Kitchens are typically used for many functions of daily life, and have been since the Stone Age. YesterTec brings a whole new look to these rooms-for-living. YesterTec furniture was created specifically to integrate leisure activities with food prep activities in a whole new way. YesterTec’s pieces that conceal large and small kitchen appliances, computers, televisions and audio components or just normal clutter can be instrumental in creating a room that must function on many social and visual levels. TOUGH: Kitchen furniture must be much tougher than any other kind of domestic furniture. Though it must be detailed more delicately like furniture, it must have the toughness of the most durable kitchen cabinets. The finishes must always hold up to the rigors of working around hot items and staining substances. And of course, YesterTec furniture is built even tougher than cabinets, because it may move several times in its lifetime. RICH: The understated design of the YesterTec line takes on an unavoidable richness once the stone or solid wood countertops are in place. There is nothing that says ’furniture’ like solid cherry countertops. The glossy, tough hi-tech finish amplifies the depth of the grain. And the unique tones and patterns of the granite tops are breathtakingly beautiful. That they arrive at the job completely finished with all edges, cutouts and holes finished is a feature that can only be done with furniture. ENDURING: YesterTec’s workstation concept goes far beyond setting a new trend. It sets a new standard! The ‘unfitted look’, the current cutting edge cabinet design trend, will fade away as YesterTec’s real working furniture line endures. Why? Because trends typically address a temporary, or sometimes fabricated need. The ‘un-fitted look’ simply combines standard cabinetry with a few furniture-like details, and then jams the cabinetry all together in a standard kitchen layout. It’s the same old thing. It only looks different. But to become enduring, it must function differently! Take the current stainless steel commercial-look appliance trend. It is aggressively promoted by appliance manufacturers for one reason, to sell appliances. As soon as someone relates this look to prison furnishings, this trend could be history! YesterTec workstations on the other hand have been developed to carefully satisfy needs that were simply being ignored by the cabinet and appliance manufacturers. TASK-ORIENTED: Each YesterTec workstation is specifically designed to handle the tasks associated with its resident appliance (a sink, refrigerator, cooktop or oven). Because each piece is separate, YesterTec workstations do not need to comply with the two foot depth cabinetry standard and each piece can be optimally designed to function even better than ever before. Generally, this means that there is more storage and counter space than normal around each appliance. Places are provided for the coffee maker , blender and food processor to be concealed right next to the sink. Refrigerators are generally linked with full-height dry-food storage capabilities. Ranges have huge drawers for large pots and pans. Even the sides of the pieces can be used from which to hang pots, dishtowels or potholders. HEIRLOOM-QUALITY: YesterTec workstations are today’s workhorses and tomorrow’s treasured antiques. They are built to last. They are built to show the wear of its users in a most gradual and natural way. They will develop a patina all their own. And they can be moved from house to house, generation to generation. HAND CRAFTED: Using the latest techniques, including power tools of all sorts, YesterTec still builds each piece one at a time. One master craftsman is in charge of each piece, insuring that the quality standards are met for each order. There is no assembly line. UNUSUAL: Getting to know what pieces are available in the YesterTec line is typically the most difficult part of design with workstations. They are so unusual, compared to the standards in the cabinet industry. But once the designer (or un-trained homeowner) is familiar with YesterTec’s catalog, magic can happen! CONTEMPORARY: YesterTec workstations can be fashioned with traditional detailing as well as minimalist detailing. A workstation styled with completely flat sides, flush-faced drawers, minimal cornices (or our metal bar cornice) and stylized grid doors illustrates just one example of how to achieve contemporary detailing. COMPATIBLE: YesterTec workstations can complement the functions of many different rooms. Especially when a room has a dual function or theme. For example, a few YT pieces separated by floor to ceiling bookshelves, including a large table in the middle can create a library/kitchen or a home office kitchen. Then there is the conservatory/kitchen filled with plants and large windows. 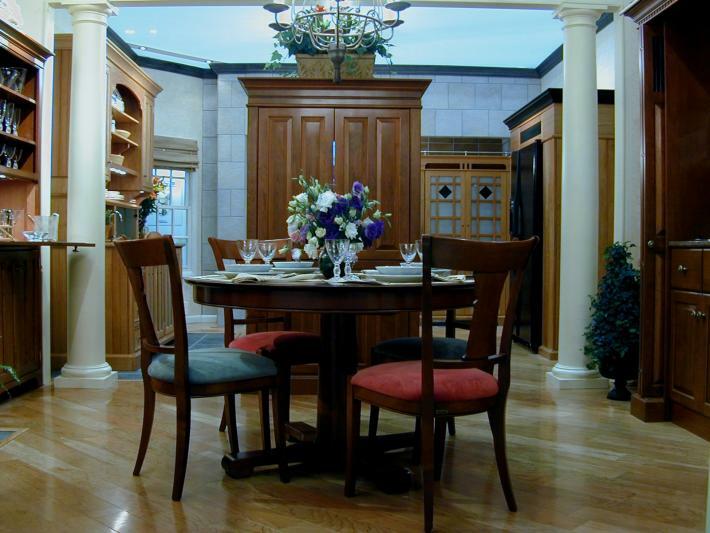 The formal dining room/kitchen is a YesterTec specialty. Island pieces, topped with a storage unit conceal the chaos of the countertops from being seen when sitting at the dining table. A serving bar, cupboards and wet or dry bar pieces complement the kitchen pieces enhancing this formal setting. YesterTec’s Unit Kitchen, the all-in-one kitchen armoire is great for a Studio/Kitchen, or one room apartment. Loft living, or open plan Living/Dining/Kitchens are the reason YesterTec developed the workstation concept. MINIMALIST: For the ‘Not So Big House’ movement, as promoted by architect Sarah Susanka, only a few YesterTec pieces are required to complete a kitchen. The avalanche of baby boomers who are moving out of their McMansions still demand quality in a smaller wrapper. This quality over quantity movement is well suited for YesterTec’s line of super-efficient, heirloom quality pieces. TRADITIONAL: The roots of YesterTec furniture predate cabinetry. Furniture was prevalent in kitchens long before built-ins. Going back to these roots, discovering the rich settings that some of the early kitchen furniture occupied was the inspiration for developing this updated version of furniture for today’s kitchens. Kitchens with furniture were typically the social and working hub of the house. But non-cooking activities also took place in the kitchen. Today, due to our very busy schedules, much of the time that we have to spare is spent in and around the kitchen. YesterTec has developed a way to combine the working parts of a kitchen into a more visually appealing living area. UPSCALE: Exclusive, Heirloom quality, Top-of-the-line. These are all terms that are associated with the term ‘upscale’. But because many people have ordered basic pieces, unencumbered by the higher priced options, YesterTec pieces are finding their way into homes of all kinds. Granted a large YesterTec kitchen with more than 6 pieces will not be affordable by all homeowners, but YesterTec’s 3 and 4 piece kitchens are easy for the above average homebuyer to afford. Adding one or two pieces to a design completed with cabinetry is a way that YesterTec breaks into the below average market. And by ordering one piece as it becomes affordable, staging a renovation over time, a young family can work up to a complete furnished kitchen, and they can take it to larger homes as they move along in life. This is impossible to do with cabinetry. UNDERSTATED: The complexity and difficulty of concealing hi-tech appliances in YesterTec’s furniture is completely understated. There are no bells or buzzers to hear, no flashing lights, or thermostats, buttons or switches in view. The system works completely behind the scenes to safely control the power that operates the appliances. In no way are the appliances altered (which could void their warranties) and the system can accommodate most brands of appliances. REAL: Many of YesterTec’s customers had looked for a long time to find kitchen furniture. They found ‘ furniture-like cabinetry” the ‘unfitted kitchen look’ and even tried to adapt antiques to kitchen use in their search. But YesterTec’s system is all about real furniture, designed from the ground up as furniture. And it is readily available. Consumers don’t need to reinvent the wheel to get what they need. DURABLE: YesterTec pieces are designed to last a lifetime. They’re tough. They are tougher than any furniture that is used for other rooms, because kitchen use is so demanding. The finishes, the drawer mechanisms and even YesterTec’s exclusive appliance hiding systems are built to last. Each piece is built to move again and again, unlike cabinetry that is built to be installed only one time. USEFUL: Each YesterTec piece must be more functionally efficient than normal cabinetry. But there are subtle characteristics that some of the pieces have that enhance their usefulness. For example, most pieces have three finished sides, with a space separating it from other pieces or doors, windows, etc. So many of our full-height storage pieces are designed to open on three sides. This gives full-height access to stored items, which is so much more efficient than the front facing banks of upper cabinets found in normal kitchens. The two exposed sides also can become areas for additional decoration such as photos, and artwork, hanging pot racks, pot holders and towel hooks (on the range or sink bases) YesterTec even makes countertop extenders that cantilever out from the sides or back of base units. These act as additional prep areas or eating counters, and can be ordered in a completely different material than the main countertop. Thus, a small chopping block extension can be just the right add-on to a range piece. And underneath the cantilevered top, there is a space for a stool, garbage can, even a pet’s bed! SOLID: Most of YesterTec’s pieces look very solid. They are designed to contain as much storage as possible. But YesterTec’s Worktables, open shelving pieces and wall/racks, have been created to break-up the all-solid appearance of the room, while providing opportunities for display/storage. ORGANIZED: Perhaps best stated by a YesterTec customer: Storage is exceptionally organized. The pull-out drawers in the pantry and other pieces are a cook’s dream; I actually like to cook now and have become much improved in this area (to the joy of my family)! I really believe its because of the joy (and pride) I have in being in this room! PORTABLE: YesterTec workstations can be moved from place to place and state to state. This makes them great for renovating because YesterTec pieces can move from one area to another just by unfastening them from the wall and disconnecting any utilities. They can move temporarily to another area, or to a new room that has been completely finished prior to moving in the kitchen pieces as the last operation, all the while keeping the functioning YesterTec kitchen intact. They can move from house to house in the same way. Blanket wrap them for the trip and they will arrive in great shape! MOVABLE: Moving a YesterTec piece requires a few strong people and a pre-determined route. Because some of YesterTec’s base units are built as one large piece, they can be heavy and bulky. Typically, four people are required to move the largest pieces but most pieces require only two people, especially if you can roll them using flat, padded furniture dollies on the hard surface walkways. In any case, a route that has been measured to accommodate them must be pre-determined. Narrow stairways and doors are of particular concern. If there are physical constraints that make access for the normal models impossible, YesterTec can build most of their line in smaller pieces (broken-down) to be assembled on site. RELOCATABLE: Sometimes, moving just one YesterTec piece in a kitchen design can do just the right thing for a small renovation. Or moving a piece and adding another. The key word is moving. Almost impossible to do with built-in cabinetry. RELIABLE: YesterTec’s exclusive U.L. Listed technology has been tested to last well beyond U.L.’s minimum performance standards. The parts should last a lifetime of use. But if something should malfunction in the future, YesterTec’s special controls and switches have been designed as a modular system that can be easily replaced. Typically, an appliance would be removed from its enclosure, an access panel would be removed and then a switch could be replaced. Controls are even easier to replace without removing an appliance. PRACTICAL: YesterTec’s workstations are not intended for large, showcase kitchens. They have been designed to bring practicality into an open plan room using as few pieces as possible to get the job done. That said, they have found real life application in kitchens of all sizes and shapes, from kitchen-only rooms to more multi-functioning rooms. Cabinetry that has been converted to freestanding furniture rarely is as practical due to their typical lack of efficiency.